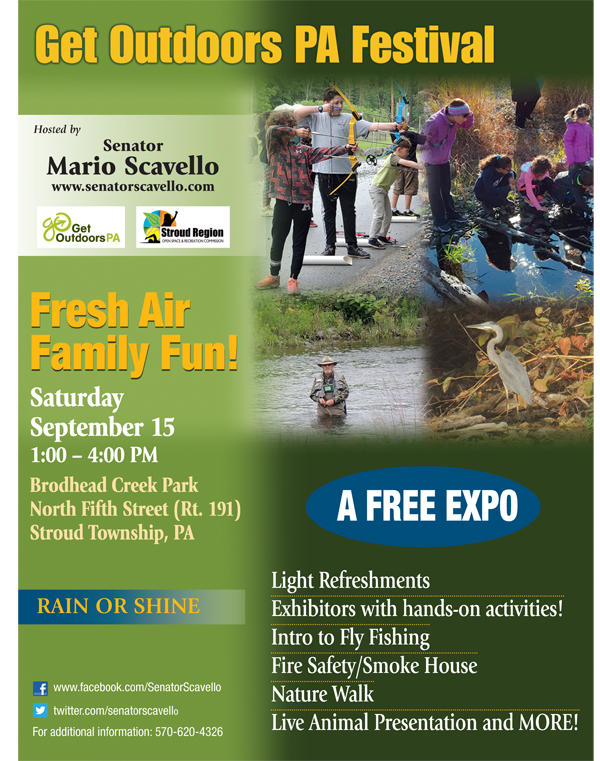 This year I’m excited to once again host the Get Outdoors PA Festival with Stroud Region Open Space & Recreation Commission on Saturday, September 15 from 1 p.m. to 4 p.m. at Brodhead Creek Park (North 5th Street, Stroud Township). 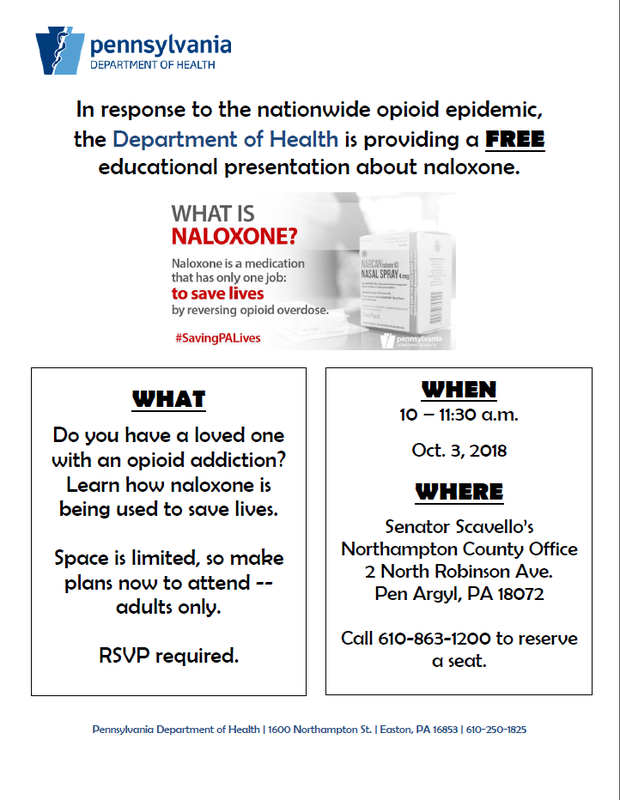 I am co-hosting a free educational presentation about the use of naloxone with the PA Department of Health on October 3rd from 10 a.m. to 11:30 a.m. Please call 610-863-1200 to RSVP a seat today. This week I introduced Senate Bill 1243, legislation to further regulate biosolid waste, otherwise known as “sludge.” This legislation mirrors the language in House Bill 2281, sponsored by State Representative Jerry Knowles. This legislation would enable a municipality to develop ordinances regulating the deposit, testing, and disposal or land application of sludge material. Further, if passed, this legislation would give a municipality the authority to veto a permit application approved by the Pennsylvania Department of Environmental Protection for the deposit or land application of this material. I share the concerns of residents of my legislative district over the land application of sludge to properties throughout our region, particularly in the Slate Belt. Passage of this legislation will provide municipalities with additional tools to address and control the use of sludge material. Pennsylvania residents can apply for rebates up to $2,000 on purchases of alternative fuel vehicles: plug-in hybrid, plug-in electric, natural gas, propane, and hydrogen fuel cell vehicles. 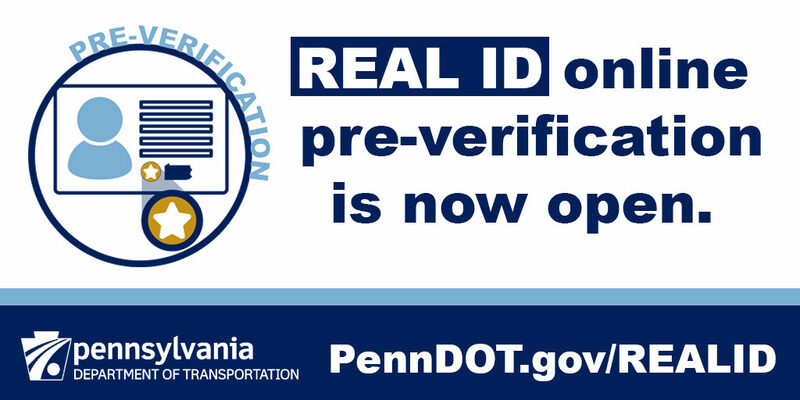 This year, leased vehicles are eligible. Businesses are not eligible for this program. You can find program guidelines, application instructions, and an up-to-date listing of rebate availability here. The Federal Emergency Management Agency (FEMA) encourages families to learn lifesaving skills such as CPR and first aid, check insurance policies and coverage for the hazards you may face, and save for an emergency. Look here for ideas on preparing for a disaster. 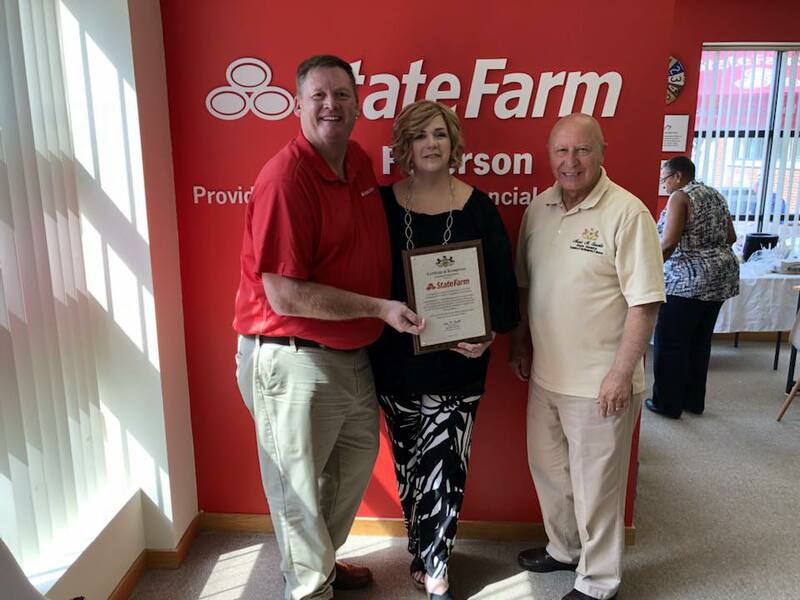 A special congratulations to Mike Peterson on the grand opening of his State Farm location on Main Street in Stroudsburg! Mike, on behalf of the local community I wish you, your family and staff the very best in all the years ahead. Thank you for investing in our town and supporting jobs in our local economy! 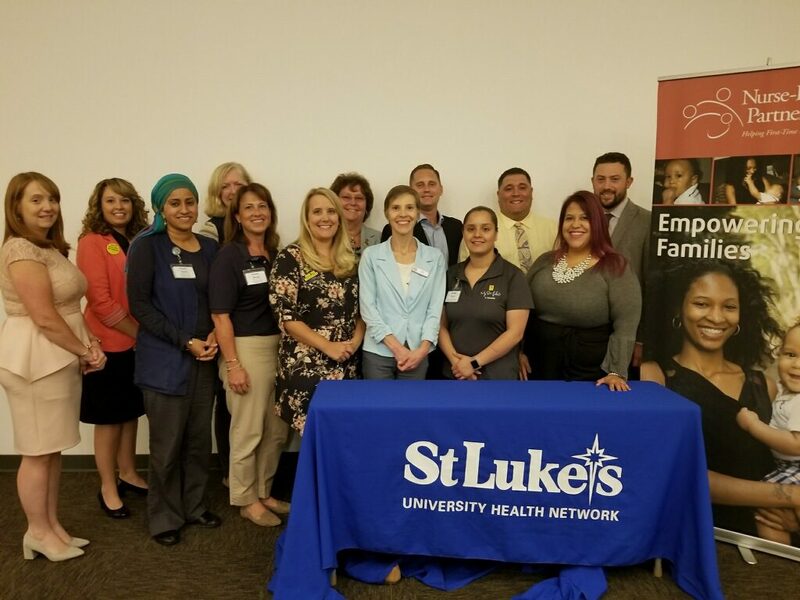 It was a privilege to attend the annual updates given by the Nurse Family Partnership (NFP), hosted by both Lehigh Valley Health Network and St. Luke’s University Health Network. The NFP plays a critical role in assisting vulnerable young mothers (and fathers too!) to have a healthy pregnancy, teach them skills necessary to raise their children and help instill self-confidence that leads to their long-term success. The testimonies provided by those who have taken part in the program were very moving and served as powerful examples of the transformative difference the NFP is making daily. 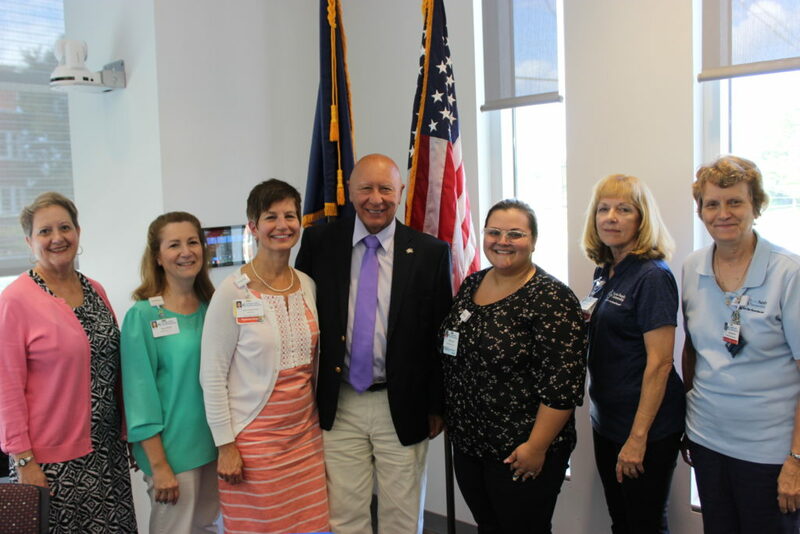 Thank you to the staff and especially the nurses who take part in the program and really invest in these young families by changing their lives for the better.